The soft voice was a goad to my conscience as the priest whispered the question from the other side of the confessional screen. I was a senior at Mount St. Joseph High School in Baltimore, MD, and was attending the mandatory senior retreat a few weeks before graduation. The talks they gave us, I can scarcely remember. Yet, what remains with me is a very memorable prayer service. It was a Saturday night, and the retreat was about halfway finished. Perhaps the bonding with my classmates and the spirituality began to come together at this point and really started to open up my heart. Maybe it was the fact that the room was in darkness with the exception of a large flickering candle. Some music was playing to help us in our reflection. There was also the opportunity to go to confession, which is when I heard that whispered question that wouldn’t leave me alone. When the priest asked me if I had ever considered the priesthood, it seemed as if he could see right through me; clear through the screen and all. Did he say that to every young man that went to confession to him? I don’t know. But, it seemed that God was trying to speak to me through this priest. In some ways, it helped to give me the push I needed to look into how one became a seminarian. When high school teens are asked to identify the most significant spiritual experience they have had in high school, the majority respond by referencing a retreat. Christ recognized the importance of making time to be still and quiet, where God could speak to a restless heart. Jesus often went to a deserted place to pray. He would routinely break away from the crowd, the Twelve, the business of routine ministry, in search of quiet and solitude. There, in the stillness, the Father would speak to his heart. Taking time away to hear that still, small voice of God in our hearts is important for all of us, but especially those discerning a calling to the religious life. Throughout the year, we Redemptorists offer several retreat experiences, inviting men from all walks of life and all corners of the country to take time apart to pray and listen to those nagging questions. This past spring, we hosted 12 men for a weekend at our retreat center in Tucson, AZ. 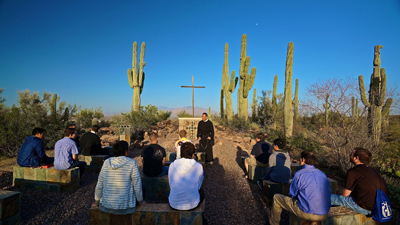 During the retreat there was time for prayer, including outdoor Stations of the Cross against the dramatic backdrop of the Sonoran Desert. And time to ask questions of each other and of God. Other retreat weekends offer men a chance to live alongside our students who are just beginning their formation as Redemptorists. These live-in experiences include time for prayer with the community, and a chance to see some of the places where we Redemptorists live and minister. Twice a year we invite men discerning a vocation to join us at the shrines of two of our Redemptorist heroes — St. John Neumann and Blessed Francis Seelos. Like young people today, Neumann and Seelos both took time away. They paused in their daily routines to hear God’s invitation to serve the poorest and most abandoned, and to give their lives to proclaiming the Good News of a God who is passionately in love with each one of us. If I hadn’t gone on that retreat, would I have heard that whispered invitation to consider becoming a priest? Maybe. Deep intimate spiritual experiences may happen in many places. For some they come during Mass. For others it’s a Redemptorist mission. Still others find it in a walk in the woods or a long talk with a trusted friend or mentor. And for some, as in my own experience, God’s grace may unfold right before our eyes as we leave the comfort of familiar surroundings to attend a retreat.